One of the most consistent questions asked by historians about watershed historical events is “what if?” Counterfactual history may be an interesting intellectual exercise, but speculating when an “Adolf Hitler” could have been stopped, thus avoiding the carnage of World War II does not alter events. However, reviewing and analyzing actual attempts to kill or overthrow the German Fuhrer is not counter factual but a valid attempt to see how close conspirators actually came to removing Hitler. There are many other questions that are associated with attempts to remove individuals who are deemed to be dangerous to society. At what point do people turn against their government? What motivates people to resist? Is it ideological, moral, or some other reason that drives individuals to say enough is enough and resort to violence to unseat an existing regime? These questions are very important when applied to the opponents of Adolf Hitler. Why did certain people oppose Nazism? Why did they wait so long to try and depose Hitler? Did some plotters of the resistance to Hitler actually participate and support genocide against the Jews and other inhumane actions? Did they try and rid the world of Hitler when they realized that the war was lost? Finally, did they find Nazism morally repugnant so they decided to strike? These questions and a discussion of those who tried to remove Hitler are examined fully in Danny Orbach’s new book THE PLOTS AGAINST HITLER. Orbach examines the full breath of available documents in a number of languages and argues that the answers to these questions are complex and conclusions cannot be considered black or white. By late 1934 Hitler and his henchmen having taken advantage of the Reichstag fire were the sole masters of Germany. After crushing the Communist Party, the Social Democratic Party, and centrist parties, the most important source of legal opposition to the Nazis ceased to exist. The Nazi Gleichschaltung (bringing into line) would swallow local governments, trade unions, and any possible opposition as they cemented their hold over Germany. Even military leaders who looked down on the former corporal supported a regime whose rhetoric promised to fulfill their goals of rearmament and a more aggressive foreign policy. A number of military leaders did question the idea of Hitler in power, but they, like the politicians felt they could control him. Any dissenters were silenced or forced to retire, and Hitler sealed the deal with the military by destroying the SA, his private army during the “Night of the Long Knives” (also known as the Roehm putsch) when the SA leadership was massacred. With the accession of the SS and the Gestapo, all opposition ceased. Orbach traces the origins of the most famous attempt to remove Hitler on July 20, 1944 to the purge of the military leadership in late 1937 and early 1938. It began with the removal of Field Marshall Werner von Blumberg, the Nazi Minister of War, and General Werner von Fritsch, the commander of the army. Both were brought down through the machinations of Heinrich Himmler and Hermann Goering as one was married to a former prostitute, the other was framed as a homosexual. The vacuum was filled by lackeys like General Wilhelm Keitel who were deemed loyal to Hitler, but an outgrowth of these events was the development of a network that opposed Nazism and wanted to change the government led by Lt. Colonel Hans Oster, an anti-Nazi and a rising star in the Abwehr; Hans Bernd Gisevius, a Gestapo agent who became Oster’s eyes and ears inside the Nazi Security Service; and Dr. Carl Friedrich Goerdeler, the former land mayor of Leipzig who resigned his office when a statue of Felix Mendelssohn was removed from the town square. These men and others eventually found the violence against the Jews repugnant, were distraught over the persecution of the church, and felt that Hitler’s dangerous foreign policy would lead to war and the destruction of Germany. Orbach outlines clearly the characteristics of a strong network or clique to foment a coup. He points to the recruitment of members based on previous friendship and acquaintances. Further, they must be relatively autonomous and protected from suspicion by the security services, i.e., the officer corps was autonomous from civilian authorities. Lastly, they are dependent upon networks of kinship, marriage, social ties, joint schooling and military service. This would lead to the evolution from being a social network to a conspiratorial one. The network would expand to include Ulrich von Hassel, the former ambassador to Italy, Ewald von Kliest, an aristocrat and major land owner, Colonel Ludwig Beck, the Chief of the General Staff, General Erwin von Witzleben, the commander of greater Berlin, and on the periphery Colonel Wilhelm Carnaris, the head of German intelligence. This network is described in one of Orbach’s most interesting chapters as he describes how they organized and planned a coup de tat for September 28, 1938. For Orbach this was one of the best chances for success because following the Anschluss with Austria, Hitler ordered Operation Green, the invasion of Czechoslovakia to obtain the mineral rich Sudetenland, an area of over three million Germans. If this could be achieved then the Czech state would effectively be destroyed. A number of leading military and civilian figures opposed the operation believing that Germany was not ready for war and would be defeated. The coup was set, but the conspirators did not count on the fecklessness of British Prime Minister Neville Chamberlain and the intercession of Benito Mussolini that brought about the Munich Conference and the ceding of the Sudetenland to Germany peacefully. Once the fear of war with Britain and France was off the table, the conspirators were finished. However, Hitler would continue his aggressive actions that eventually resulted in the events of early September, 1939 with the invasion of Poland and the official beginning of World War II. The Oster, Goerdeler, and Beck network was too small to stage a successful coup especially with higher echelons of the Nazi regime intoxicated with events up to the invasion of the Soviet Union in June, 1941. The expansion of the German resistance movement was a direct reaction to Operation Barbarossa, and with it the only option seemed to be the assassination of Hitler. The movement expanded and its tentacles reached further into the army, foreign office with improved connections between cells. Many like Hermann Kaiser, a former history teacher, and reserve officer; and Lt. Col. Henning von Tresckow, a senior operations officer in the Army Group Center on the eastern front reacted to the carnage and slaughter in the east perpetrated by SS Einsatzgruppen. In 1941 and 1942 there was little that could be done to stop it, but with the fall of Stalingrad the resistance was emboldened and a number of assassination attempts against Hitler were planned but failed due to a change in the Fuhrer’s schedule, bad luck or other unforeseen problems. One of the most surprising aspects of the book was Orbach’s discussion of the role of Admiral Wilhelm Carnaris, a conservative nationalist who could not accept the brutality of the Nazi regime. Carnaris disgusted by what he saw in Warsaw worked to save over 400 people including Rabbi Joseph Schneersohn, the Lubacitche Rabbi. Carnaris worked further to smuggle Jews out of Germany using the excuse he was planting spies abroad. By 1943 leadership of the resistance fell, almost, by default to Count Claus von Stauffenberg, a romanticist and elitist whose career would bring him to Hitler’s General Staff. Orbach presents an in depth chapter dealing with von Stauffenberg’s evolution in finally becoming the leader of the movement and deciding that only he had the courage and position to kill Hitler. Orbach carefully explains the organization of the conspirators, how they planned, communicated, recruited, and compartmentalized their networks from each other. Orbach’s analysis included the personality clashes within the movement and the shadow government that was created designed to govern Germany after the Nazis were removed. 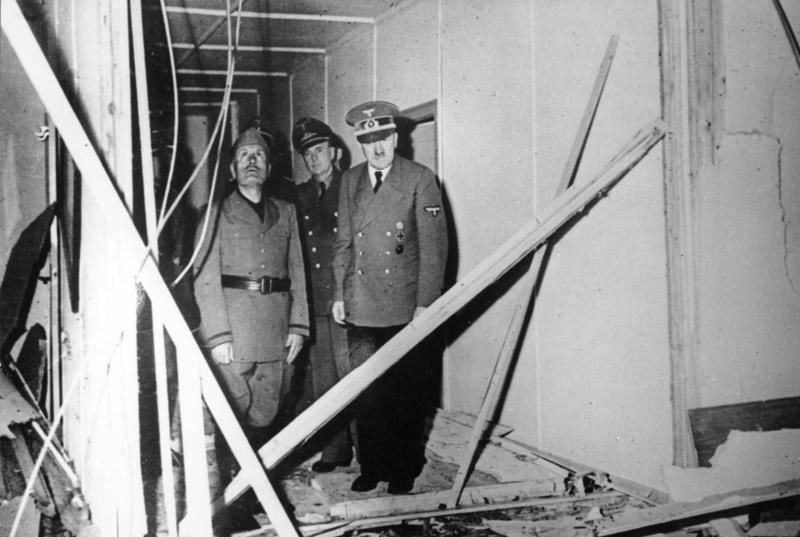 All their plans failed as Hitler survived the July 20, 1944 bomb blast and Orbach explains that none of the conspirators had any training in the art of the coup de tat which in part explains why it was not successful. Orbach drills down in reviewing mistakes that were made and the fate of the perpetrators once the plot was uncovered. Orbach’s conclusions are well supported by his ambitious scholarship and research. I believe the most important question explored in the narrative is what led people to oppose Hitler. Was is a combination of their hostility toward murder, genocide, fear that Germany could not win a world war, opportunism, or the dechristianization of Germany? Orbach further argues that it “perhaps comes down to the elements composing motive, the aggregate of psychological processes and factors pushing one across the Rubicon into the shadowy world of revolutionary conspiracy. It may well be difficult to define the elusive mix that constitutes such an imperative. The best I can do is to suggest three necessary components: its foundation, substance, and impetus.” The foundation seems to be empathy, the substance is a system of values, and the impetus was exceptional courage. Orbach’s narrative, at times, reads like a murder mystery, as well as a historical monograph. Orbach should also be given credit for presenting then debunking numerous myths associated with events which makes the book a useful contribution to the increasing number of studies dealing with the German resistance. Because of Orbach’s approach and smooth writing those who are interested in the topic should not be disappointed.